Klikněte na fotografii a zobrazte všechny dostupné fotografie k Veeve - Townhouse by the river. Situated 3.4 km from Natural History Museum and 3.5 km from Victoria and Albert Museum, Veeve - Townhouse by the river is located in Wandsworth of London. 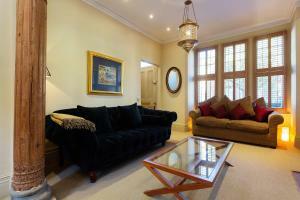 This holiday home is 3.9 km from Stamford Bridge - Chelsea FC and 3.9 km from Buckingham Palace. The holiday home is equipped with 3 bedrooms, a TV and a fully equipped kitchen that provides guests with a dishwasher. Harrods is 4.2 km from the holiday home, while O2 Academy Brixton is 5 km from the property. London City Airport is 19 km away. Please note the lead booker must be over the age of 25 Please inform Veeve - Townhouse by the river in advance of your expected arrival time. You can use the Special Requests box when booking, or contact the property directly with the contact details provided in your confirmation. Guests are required to show a photo identification and credit card upon check-in. Please note that all Special Requests are subject to availability and additional charges may apply. A security deposit of GBP 690 is required upon arrival for incidentals. This deposit is fully refundable upon check-out and subject to a damage inspection of the accommodation.